means love for the children and peace of mind for their working moms. 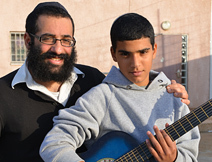 Children of poor working parents, especially single mothers, are a primary concern of Colel Chabad. 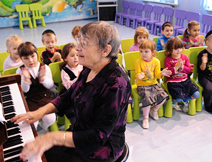 The youngest of these are cared for and nurtured at Colel Chabad’s growing network of beautiful airy and loving daycare centers. For older kids, we provide afternoon programs and Big Brothers and Sisters to make sure they never fall through the cracks. and young childrenreceive daycare services allowing their mothers to supplement the families meager incomes. From infancy to the marriage canopy, Colel Chabad is there for children from widowed and distressed families. Our growing network of daycare centers sets the standard for childcare. Our summer camps keep vulnerable kids off the streets. Our hospital programs bring the joy of holidays and the summer camp experience to the hospital ward. And our after school programs make the difference between despair and success for children in need. The work is never done. More daycare centers are needed. More kids are hoping for a few weeks of summer camp. We would love to expand the network of hospitals we serve. And additional after school programs are needed throughout Israel.